Arayo's Ride: Lions and Tigers and Bears, Oh My! The trim white-haired woman faces the 500 pound wild animal. With paws that could filet her with ease and jaws that could render her faceless, the woman gently puts half a peppermint between her teeth and bends towards the enormous creature. With equal tenderness, the black bear brings his face to hers and accepts the treat. "Now, go into your den," she demands, and the bear turns and goes inside his house. Found 23 years ago roaming the roads, the young bear was brought to Ron and Gail Rogerson who own Oaklawn Farm Zoo in Aylesford Nova Scotia. "People were trying to run him down on their ATV's and had killed his sibling. It was obvious he wasn't going to survive on his own in the wild so we took him in," Gail said. Another smaller bear was found after he was hit on the road. He was so weak that a woman was able to pick him up and carry him. He, too, was brought to the Rogerson's. It was touch and go with that one for quite a while, but he made it. But rather than welcome company, Smokey, the original bear, didn't appreciate the addition of another bear in his space. "He stayed at far end of pen and wouldn't come near him for days." Once a bear is used to people it can't be released into the wild. It becomes trusting of humans and is an easy mark for bear hunters. I visit with Gail as she leans over to hug one of their sleek massive jaguars when suddenly she is pounced on from the rear by the other cat. Huge paws wrap around her shoulders and the cat buries its big head in her neck. Gail staggers forward and catches herself on the fence, then laughs and shrugs off the feline. "You prankster," she scolds. "You got my clean shirt all dirty!" "Always hold your ground with a cat," Gail explains. "I've had times when one panther will jump up to hug me from the front, another from the rear and I'm a panther sandwich, but if I don't fall to the ground, I'm okay." Instinct kicks in when someone goes to the ground and the cats will come in for the pounce. "Face a wild cat, don't show fear and slowly move away from it. A scared cat is the most dangerous." She points to a big orange and white tiger and explains that of the 16 cats that they have, he is the most dangerous. Gail goes into its pen to clean and feed him but never trusts him. "You sense he is nervous. You can see it in his eyes." The Rogersons have always had exotic animals. Fancy birds, goats and such. "We were letting school groups come out to see the animals," says Ron. "1,800 kids would tour through here, then the kids would come back out and bring their parents. We had to either stop allowing groups to come or open a zoo and start charging, so they applied for a license and opened as a licensed zoo in 1984.." They began phasing out the livestock and brought in tigers, monkeys and such. 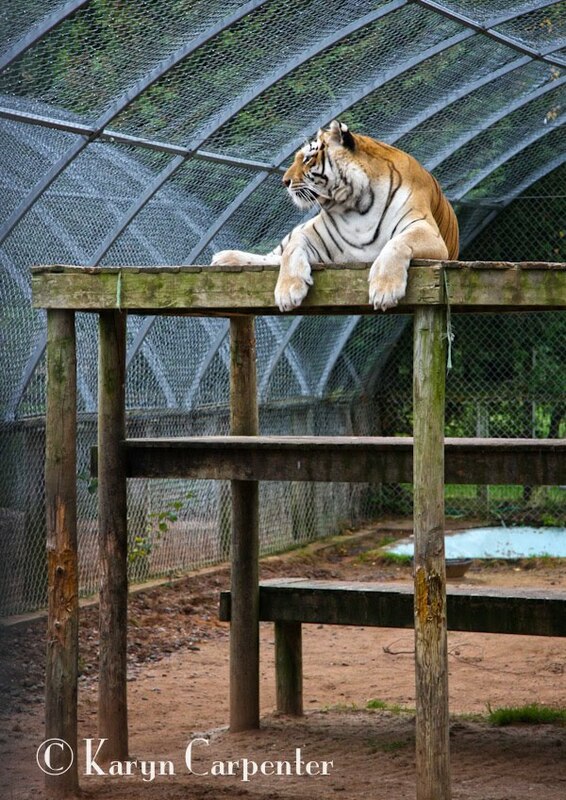 Though the couple now has a staff of 20 to help with the zoo, feeding of the more dangerous animals still falls on Ron and Gail, who have established a trust of the animals they care for. Gail feeds and cleans up after the bears and cats while Ron handles the primates. "When Ron goes in to feed the gibbons, he wears a hat. I wear a helmet," Gail explains. Gibbons mate for life and are very jealous. Once, Gail went into the gibbon pen and approached the male. The female came up and with her strong arm slapped Gail across the face. "We don't have gorillas, orangutans and chimps," says Ron. "Chimps are awful. They share a common ancestor with humans and are jerks. By the time a chimp is 12 it is like a psychotic person, plus you need special fencing and houses for them because they can get out of anything. You can't trust them." Owning and running a zoo was never a plan for the Rogersons but with their knowledge of wild animals they have found their calling rehabilitating wounded animals who come to them and releasing them back to the wild when possible. Others remain with them and are cared for while introducing and teaching children of the area those creatures we share the planet with. Photos: The zoo's most dangerous cat sits atop a platform and surveys his domain. 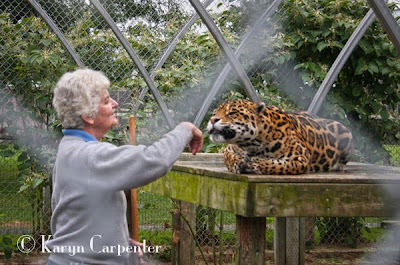 Gail Rogerson interacts with one of the spotted leopards at the Oaklawn Farm Zoo in Aylesford Nova Scotia. Cudos to the Rogersons! Thank heavens for them, and other like them.